Ted Cruz sophisticated Muslim bashing: How the Texas senator peddles bigotry. This is how you bash Muslims while pretending to be principled. Sen. Ted Cruz on Oct. 28, 2015 in Boulder, Colorado. Sen. Ted Cruz is going mainstream. As Slate’s Jim Newell and Jamelle Bouie have reported, Cruz now sees a realistic path to the Republican presidential nomination and is repositioning himself, accordingly, as a statesmanlike alternative to Donald Trump. The tricky part is tapping into the same resentments Trump exploits—anti-immigrant, anti-Islam, anti-black—without doing it quite so crudely. There’s a fine art to this sort of manipulation. You have to touch the right nerves—fear of a black president, indignation at bilingualism, hunger for retaliation against Muslims—while cloaking your demagoguery in the language of terrorism, sovereignty, and the rule of law. Cruz, a skilled lawyer and wordsmith, is demonstrating this technique in his current campaign against Muslim immigrants. Eight months ago, when Cruz announced his candidacy, he pledged to defeat “radical Islamic terrorism.” This formulation allowed him to excoriate President Obama for refusing to acknowledge that our enemies were Muslim. At the same time, it insulated Cruz from charges of naked sectarianism. Cruz wasn’t against all Muslims. He just wanted to protect us from radical, terrorist Muslims. For more than a week, in nearly every speech and interview, Cruz has underscored this threat. To protect the United States, he argues, we must deny entry not to all refugees or to all Syrian refugees, but to Syrian Muslim refugees. In a tour of right-wing media, Cruz used this phrase twice on Sean Hannity’s show, three times on Glenn Beck’s show, three times on Graham Ledger’s show, four times on Steven Crowder’s show, and five times on Mark Levin’s show. Christians are being crucified right now, Glenn. They’re being beheaded. And the president says it’s offensive and un-American to want to provide safe haven. Just three percent of the Syrians that this administration has let in are Christians. He’s ignoring the [genocide] directed at Middle Eastern Christians. Obama, in Cruz’s view, is a callous bigot for inadvertently limiting Christians—who represent 10 percent of Syria’s population—to 3 percent of the refugees we admit. Cruz has a fairer idea. He would explicitly limit Muslims, who represent 87 percent of Syria’s population, to 0 percent of the incoming refugees. That’s the sound of a politician reaching for an excuse. 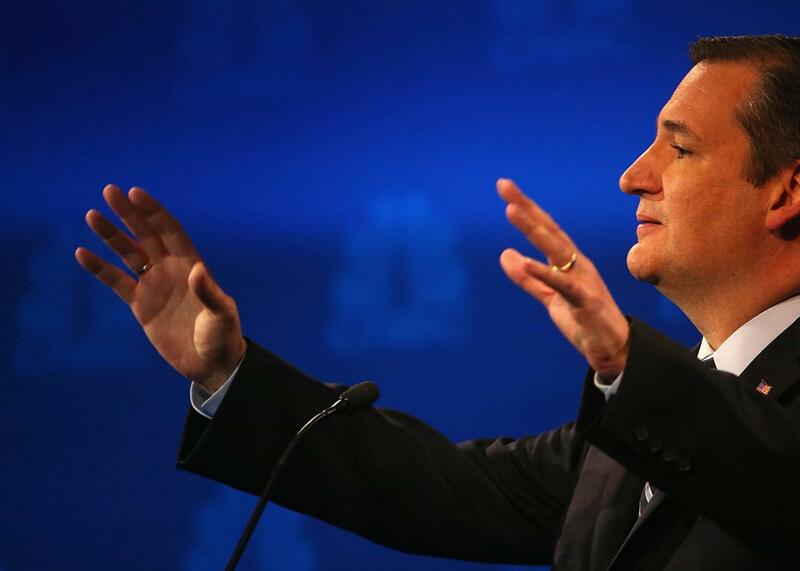 When the applicant is a professed Christian, Cruz relaxes his skepticism. His heart melts, and so does his brain. Any sensible analyst will tell you that terrorists use whatever disguise they think you’re not looking for. This year, ISIS operatives have staged multiple attacks by posing as Iraqi soldiers, Kurdish security forces, and women. Two months ago, an ISIS militant disguised himself as a woman to blow up 10 people at a mosque in Yemen. In July, a former spokesman for the Free Syrian Army claimed that ISIS was plotting to dress female militants in Western clothing and send them to Europe disguised as tourists. Anyone who thinks terrorists would refuse to disguise themselves as Christians, if that’s who we’re letting in, is a fool. The second clue is Cruz’s omission of Shiite Muslims. Fifteen to 20 percent of Syrians (or fewer, depending on how you define them) are Shiites. ISIS reviles these people. ISIS claims to represent Sunni Islam, the faith’s other major branch, which encompasses three-quarters of Syria’s population. To purify Islam, ISIS seeks to annihilate the Shiites. According to Human Rights Watch, ISIS has systematically “executed Shia captives,” with a death toll in the hundreds, and probably thousands. ISIS has destroyed Shiite mosques, forbidden Shiite rituals, and expelled Shiite residents. Earlier this year, ISIS beheaded eight Shiite men on camera, calling them infidels. Its fighters segregate Shiites for termination by asking captives how they pray, where they live, and what music they like. If Cruz’s refugee policy were designed to help victims of persecution, he would have named Shiites as a protected class. But he hasn’t. In his recent speeches and interviews, I can’t find a single instance in which he has mentioned these people. That’s because they confound his distinction between Muslims and persecuted minorities. Shiites are Muslim victims of ISIS. They force you to decide: Are you for excluding all Muslims? Or will you draw distinctions within Islam? Cruz has made his choice. That’s what’s really going on. Cruz isn’t agonizing over the mechanics of vetting refugees. He’s exploiting anti-Muslim anger and sucking up to the Christian right. And he’s doing it while wearing his own disguise: principled leader.